Santa Cruz, California is the home of barefoot hemp-wearing earth-mamas, world-famous surf breaks, and mossy redwood forests of epic proportions. Down on Pacific Street you see everything from bass-thumping Chicano low riders to panhandler addicts with cats riding on their shoulders. And of course the Umbrella Man who walks the street wearing all pink and moving as slow as molasses in winter. 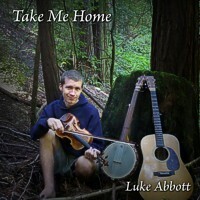 Just when I thought I’d seen it all, along comes Santa Cruz resident Luke Abbott and his most excellent new solo CD titled Take Me Home. If I lived in Cruz I probably would have seen the Abott Family playing bluegrass on the street before now. But it wasn’t until about a week ago that I stumbled upon the Abbott Family website and their Web TV series (I was looking for some lyrics). It’s worth exploring, especially the amazing collection of old-time song lyrics with an MP3 clip of each song, for those of us who play music by ear. But this post is about Luke’s new record, a soulful and authentic collection of classic old-time Americana played on guitar, banjo, fiddle, viola, and dobro. With this release, an amazing young whippersnapper rises through the ranks to stand with the very best modern performers of old-time music. Under the obvious influence of the Holy Trinity (Bruce Molsky, Dirk Powell, and Tim O’Brien), Luke shows us that not only does he know his axes inside and out, but his voice is a powerful asset and he’s not afraid to use it. The packaging and his website include ample liner notes on each track. Fiddlefreak recommended! I did not see llet the church roll on…. Instead you have this mild bluegrass on your site. I heard it WVA as a child Theres wimen in the church with paint on their face what you gonna do kick out kick out and let the chruch roll on. I had to go to Utub to be sure I had the right Luke Abbott. You need to go to play at the Mackeral Snapper Supper in Chester Nova Scotia…. this summer. I wlll look for you.